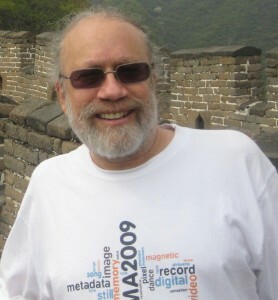 Howard Besser, Professor of Cinema Studies and Director of New York University’s Moving Image Archiving & Preservation Program and Senior Scientist for Digital Library Initiatives for NYU’s Library. The following is a guest post from Julia Fernandez, this year’s NDIIPP Junior Fellow. Julia has a background in American studies and working with folklife institutions and worked on a range of projects leading up to CurateCamp Digital Culture in July. This is part of a series of interviews Julia conducted to better understand the kinds of born-digital primary sources folklorists, and others interested in studying digital culture, are making use of for their scholarship. Continuing our NDSA Insights interview series, I’m delighted to interview Howard Besser, Director of New York University’s Moving Image Archiving & Preservation Program (MIAP) and Professor of Cinema Studies at NYU. He is also one of the founders of Activist Archivists, a group created in the fall of 2011 to coordinate the collection of digital media relating to the Occupy Wall Street political movement. Julia: Could you tell us a bit about Activist Archivists? What are the group’s objectives? What kinds of digital media are you exploring? Howard: Activist Archivists began with the question of how archivists could help assure that digital media documenting the “Occupy” movement could be made to persist. This led us into a variety of interesting sub-areas: getting individuals making recordings to follow practices that are more archivable; documenting the corruption of metadata on YouTube and Vimeo; evangelizing for the adoption of Creative Commons licenses that would allow libraries and archives to collect and make available content created by an individual; making documenters aware that the material they create could be used against their friends; and a host of other sub-areas. We focused mainly on moving images and sound, and to a lesser degree on still images. 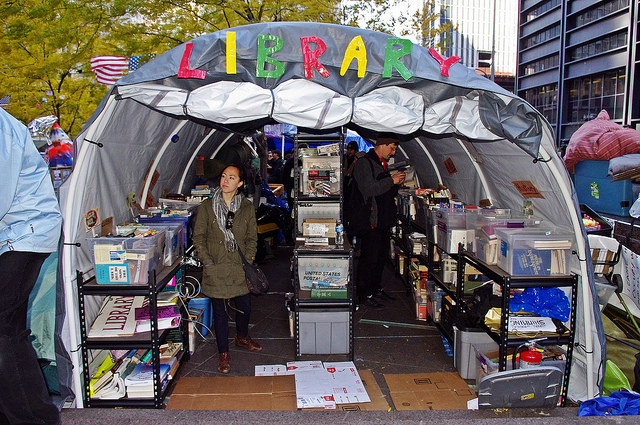 As the Occupy movement began to dissipate, Activist Archivists morphed into a focus on community archiving that might be analog, digital or a hybrid. We worked with Third World Newsreel and Interference Archive and in 2014 produced the first Home Video Day in association with members of the NYC Asian American community and Downtown Community Television. And several Archivist Archivist members are on the planning committee for the 2015 Personal Digital Archiving Conference. Julia: Could you tell us a bit about the digital materials you are working from? What made them an interesting source for you? Peoples Library Occupy Wall Street 2011 Shankbone, shared by user David Shankbone on Flickr. Howard: Working with Occupy, we were mainly dealing with sound and images recorded on cellphones. This was particularly interesting because of the lack of prior knowledge in the library/archiving community about how to employ the wealth of metadata that cellphones captured while recording images and sound. For example, it’s very easy to set a cellphone to capture geolocation information as part of the metadata coupled to every image or sound that is recorded. And this, of course, can raise privacy issues because a corpus of photos one takes creates an exact path of places that one has been. The other thing that made this project particularly interesting to me was how social media sites such as YouTube strip away so much metadata (including much that could be useful to archives and scholars). Julia: What are some of the challenges of working with a “leaderless” and anti-establishment movement like Occupy? Howard: It’s always difficult for people who have spent most of their lives in hierarchical environments to adapt to a bottom-up (instead of a top-down) structure. It means that each individual needs to take on more initiative and responsibility, and usually ends up with individuals becoming more intensively involved, and feeling like they have more of a stake in the issues and the work. I think that the toughest challenge that we experienced was that each time we met with an Occupy Committee or Group, we needed to start re-explaining things from scratch. Because each new meeting always included people who had not attended the previous meeting, we always had to start from the beginning. Other major problems we faced would always be true in all but the most severe hierarchical organizations: how do you get everyone in the organization to adopt standards or follow guidelines. This is an age-old problem that is seldom solved merely by orders from above. Julia: Activist Archivists has printed a “Why Archive?” informational card that spells out the importance of groups taking responsibility for the record of their activity. 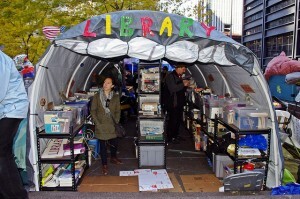 If libraries and archives wanted to encourage a more participatory mode of object and metadata gathering, what would you suggest? What would you want to see in how libraries and archives provide access to them? Howard: One of the earliest issues we encountered with Occupy was the prevalent notion that history is documented in book-length essays about famous people. Many people in Occupy could not see that someone in the future might be interested in the actions of an ordinary person like them. Now, a third of a century after Howard Zinn’s “A People’s History Of The United States,” most progressive historians believe that history is made by ordinary individuals coming together to conduct acts in groups. And they believe that we can read history through archival collections of letters, post-cards and snapshots. Librarians, archivists and historians need to make the case to ordinary people that their emails, blogs and Flickr and Facebook postings are indeed important representations of early 21st century life that people in the future will want to access. And as librarians and archivists, we need to be aggressive about collecting these types of material and make concrete plans for access. Julia: In a recent NDSA talk (PDF) you identified some of the challenges of archiving correspondence in the digital age. For one, “digital info requires a whole infrastructure to view it” and “each piece of that infrastructure is changing at an incredibly rapid rate”; and also “people no longer store their digital works in places over which they have absolute control,” opting instead for email services, cloud storage or social network services. What are some effective approaches you’ve seen to dealing with these challenges? Howard: Only institutions that themselves are sustainable across centuries can commit to the types of continuous refreshing and either migration or emulation that are necessary to preserve born-digital works over time. Libraries, archives and museums are about the only long-term organizations that have preservation as one of their core missions, so effective long-term digital preservation is likely to only happen in these types of institutions. The critical issue is for these cultural institutions to get the born-digital personal collections of individuals into preservable shape (through file formats and metadata) early in the life-cycle of these works. As we found in both the InterPARES II Project and the NDIIPP Preserving Digital Public Television Project (PDF), waiting until a digital collection is turned over to an archive (usually near the end of it’s life-cycle) is often too late to do adequate preservation (and even more difficult if the creator is dead). We either need to get creators to follow good practices (file formats, metadata, file-naming conventions, no compression, executing Creative Commons licenses, …) at the point of creation, or we need to get the creators to turn over their content to us shortly after creation. So we need to be aggressive about both offering training and guidelines and about collection development. This is a syndicated post. Read the original at The Signal: Digital Preservation 2014-10-10. ← So you want to reuse digital heritage content in a creative context? Good luck with that.